The patented swing arm shock absorption technology reduces stress impact on the knee, hip joints, lower back and ankles. A mechanical spring system cushions the feet on impact. This helps distribute the impact over a larger area instead of it getting focused on a single area. It also enables the foot to be longer on the deck resulting in increased muscle contraction. Monitoring how your workout affects your fitness level is important since it gives you an opportunity to identify the workout program that makes the most impact. The console has an iPod docking station with speakers and this enables you to listen to your favorite music as you do your workouts on the treadmill. At the top of the console, you have a cooling fan with three speed settings. You may be able to control the speed settings using a button next to the speed adjustment. Speed and incline buttons help you choose any type of workouts you want. Console feedback is clearly displayed on the backlit screen and this includes the workout program, calories burnt, heart rate, incline level, speed and distance. Static information of the user such as height, weight and age are also displayed. The fitness level of the user is also recorded. It has 15 pre-set workout programs that the users can choose. These 15 programs include 3 target programs where speed, time, and distance can be set up or down. Next are 3 preset programs with 12 level of intensity. IWM is an automatically generated program that determines the workout for each individual user. The speed interval workout program has 12 levels of intensity. Weight loss program can help you adjust the incline and speed at 12 different levels. The walking learns program records changes made by the user and uses them in future workouts. Heart rate control program reads the heart rate of the user to maintain maximum performance. The fitness test program is based on the heart rate recovery. A set of 3 memory data slots can be used to store the user’s favorite fitness program. Powerful Motor: The treadmill has a powerful motor that supports running speeds of 5 – 11 mph. The heavy flywheel is balanced to provide a complete operation. Shock Absorption: Variable cushioning with a floating deck provides firm support to the runners. The patented swing arm technology reduces the impact on knees and back. Ergonomic Designed Console: The console has quick start buttons that are designed in an ergonomic way and this enables you to access them easily. Entertainment: The iPod and MP3 port with high definition speakers can help you listen to your favorite music. This provides good entertainment as you workout. Low Maintenance Deck: The deck with 3 layers of lamination is designed for a lifetime of maintenance free use. Most cheap treadmills available in the market need the belt to be lubricated at regular intervals. Amazing Workout Programs: The 15 pre-set workout programs make it easier for beginners and experienced runners to choose programs as per their individual workout routines. Multiple users may be able to save different programs depending on their preferences. Heart Rate Monitor: The wireless hand grip helps monitor the heart rate. This enables you to increase or decrease the intensity of the workout. Warranties: It has a lifetime warranty on the motor and frame. Additionally, it has a 5 year warranty on parts and 2 years on in home labor. You can also choose to purchase additional service plans of 3, 4 and 5 years. Large Size: One of the biggest letdowns of this treadmill is its large size. It cannot be folded to save space. 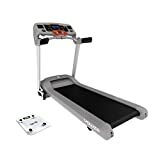 The Yowza Daytona Treadmill is a great buy compared to other models with similar features and price. The high quality motor and scratch resistant frame with the built-in workouts make it stand out from other models. This machine is the best in its class with the amazing warranty package. It is ideally suited for both amateurs and experienced runners.